Which is best to book your honeymoon? Travel Agent or Internet? Travel Agent vs. Internet: Which is best to book your honeymoon? You are here: Home / Honeymoon Planning / Travel Agent vs. Internet: Which is best to book your honeymoon? What’s the best way to book your honeymoon, a travel agent or the internet? It seems like with the internet and online booking engines, why would you book your honeymoon trip or destination wedding through a travel agent? What’s the benefit of using a travel agent? What can they do that the computer can’t? Brides are always asking these questions, almost as much as they ask where the best place to honeymoon is. So, how about a little friendly competition to settle this modern debate. Which is best for booking your honeymoon, humans or computers? The rules of engagement. 4-grueling rounds of head-to-head competition comparing the two to determine who is the best to book your honeymoon trip: HUMANS or COMPUTERS. I’m busy planning a wedding and working (or in college), I want the easiest and fastest way to plan my honeymoon. Statistics show that brides spend an average 37 hours per month on wedding planning. The internet has made it easier offering tons of information and inspiration to plan a honeymoon, in fact it can be too much of a good thing! With all of the travel options available, and resources like review websites and booking engines you can easily lose countless hours to researching the honeymoon options and comparing packages. A travel agent will work with you to determine your preferences and budget, then present options that best fit your needs. Finding a travel agent that you can trust will make the honeymoon planning easy peasy! I love a great bargain and want the very best “deal”. When you “cut out” the middleman you always get the best deal, right? I know that this defies common logic but it’s simply not the case. Generally, the pricing offered through a travel agent is the same as online, and if there is a difference we can match it! We can even offer free room upgrades, special candlelight dinners, and other added value. The internet has made it easier to find the best deals but, you’ll often drive yourself crazy searching for the best one since airfare and room rates are constantly changing. I already know where I want to honeymoon… at the same resort that (fill in blank) recommended. They absolutely loved it!! The internet makes booking a package really easy. A handful of clicks and you’ll be on your way, right? Sometimes, it’s not that simple. For example, how do you know which is best room category for you. What about special diets or medical needs? The honeymoon planning doesn’t end when you’ve booked your package, it’s only beginning and when you work with a travel agent they’ll be the one handling all of these little details so that you all you’ll need to do is pack! Something goes wrong, you’ve missed your connecting flight or the hotel doesn’t have your reservation. What next? Who do you call? If you’ve booked your package online you’ll be on your own. You’ll be the one negotiating with the airline ticket counter or in the 800# call center queue resolving the problem. When you book your honeymoon package with a travel agent you’ll have a human being to call… and travel agents have far more resources to work with than the average customer. Trust me, resorts and airlines want to keep the travel agents satisfied so that they’ll keep sending visitors. I’d definitely say that computers were KO’d by humans!!! Booking your honeymoon with the help of a knowledgeable travel professional is the best. Destination Wedding Experts will save you time in finding the perfect honeymoon destination and customize a package to fit your needs. 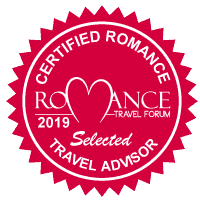 Our travel agents will be with you every step along the way- before, during, and after your trip to ensure that your honeymoon is completely stress-free!! Ready to turn over the honeymoon planning now? We can’t wait to hear about your dream getaway! Submit a no-obligation honeymoon quote request and let’s mark the honeymoon off your wedding to-do list.